← ina’s old-fashioned banana cake. roasted sweet potato salad with chutney vinaigrette. Thanksgiving is coming, did you hear? As I’m sure I’ve noted in the past, it’s not my favorite holiday – and I could do without the inundation of all things pumpkin (sorry, Tina) and the constant discussion of turkey. While I love the dressing and the sweet potato casserole and whichever type of salad Mammy makes, I could really take or leave the rest of it. Thanksgiving, for me, mostly means that I can finally justify dragging Matt to get a tree, and we can get to decorating for Christmas. That said, I know a lot of you love Thanksgiving and everyone’s always looking for new ways to change up the same old vegetables. And though I’m not sure why anyone would want to stray from your typical, delicious sweet potato casserole (with marshmallows, duh), this roasted sweet potato salad might be just what you’re looking for. It’s FANTASTIC. Just don’t overcook the sweet potatoes… which I did. Preheat oven to 425. Line a baking sheet with foil, and spray with cooking spray. Toss sweet potatoes, oil, salt, cumin and ginger directly on sheet. Roast for about 30 minutes, stirring occasionally. Do not overcook. When they are tender, remove from oven and allow to cool slightly. Meanwhile, in a small bowl combine balsamic, chutney, dijon, honey and garlic. Whisk in olive oil to form a dressing. 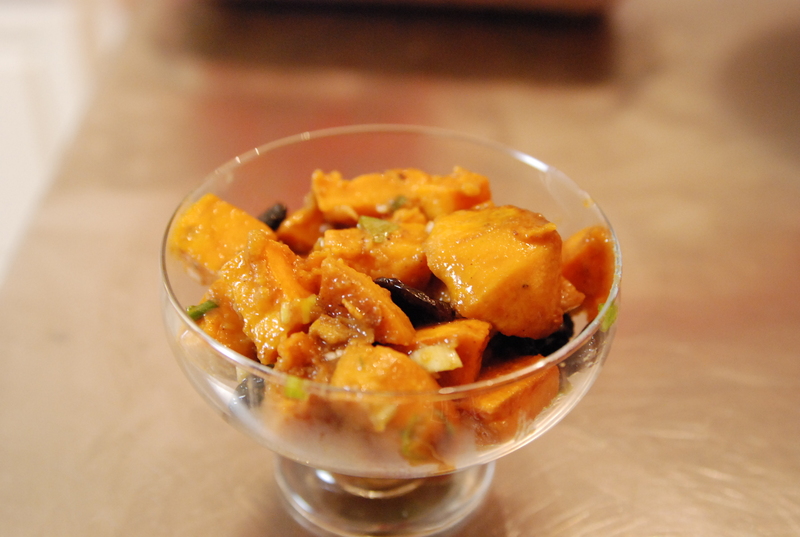 In a serving bowl toss sweet potatoes, scallions, cherries and dressing. Serve. The original recipe calls for almonds and dried cranberries. Naturally, I left out the almonds and replaced the cranberries with cherries. Suit yourself! And I have full intention of fiddling with the dressing to pour over actual salads, such was my love for this.